1) Letting Emotions get Involved - We all know that buying a new home can be an exciting time but I often see Buyers let these emotions overtake good financial decision making. While "bidding wars" are not as common as in previous years, we still see Buyers overpaying for properties, especially new Real Estate Investors. It's absolutely necessary to have an honest professional on your side that knows the local Real Estate market and can properly value a property. There is so much incorrect information online now that it can be easy for someone who doesn't see the numbers everyday to think they are getting a great deal. Real Estate Investing is a Hot topic and new Investors often forget to include the costs of holding or financing a property in their calculations. In fact I currently have an investor client who buys 5 or 6 properties a year and says he calls me first to "talk him out of buying the property" because he knows that I know my numbers and won't let him overpay. 2) Buying a home at or just above their Budget - Recall back in the mid 2000's when banks would give mortgages to anyone with a heartbeat. Banks have gotten smarter but people have not. Just because a Lender says you can qualify or get pre-approved for a $750,000 Home doesn't mean that you should. Buyers often forget that they need to have 1-2% in savings for home emergencies or repairs. A broken appliance or air conditioner can be expensive to replace these days. A plumbing, roofing or electrical repair can often add up to thousands of dollars rather quickly. Even General Maintenance and upkeep can cost 1-2% of the home's value per year. My advice is to search for homes just below your "approved" amount. Know your budget, be realistic and stick to it. 3) Not getting "Pre-Approved" prior to their Home Search - There is a difference between a potential buyer getting "Pre-Qualified" or "Pre-Approved". Pre qualifying is just an estimate of how much a lender thinks you can afford. A Pre-Approval is a conditional commitment from a lender based on your financial data and credit checks. Getting a Pre-Approval is absolutely the first step to buying a home. 4) Making large purchases prior to Closing on the property - The deal isn't done until Closing date. I'll never understand why a person goes out and buys a new car when they buy a new home but it happens more often than you would think. I have seen buyers go out and finance that perfect furniture set prior to closing on the home. These purchases can affect your credit score and even affect it enough to where the buyer will no longer qualify for the mortgage. I tell buyers to just sit tight until the deal is done. There is nothing you need right now today that can't wait a few days. 5) Going it alone - As we said previously, there is a ton of information online these days so a buyer can think they can save a few bucks without hiring a professional Realtor. First of all, much of the information you find online is not truthful and not in the buyers best interest. Second of all, Real Estate commissions are usually paid for by the Seller of the home so it costs the Buyer nothing to have someone in their corner for what may be the largest financial decision of their life. We can probably look up a pretty accurate description, instructions or video of how to do heart surgery but I don't think most people would try to operate on themselves. Hire a Professional. This is especially important when going to Open Houses or New Construction Homes. Do you really think that agent sitting in the Builders Model Home Office has your best interest in mind? They work for the builder and your Buyer Agent's commission is already built into the marketing budget for the project. I can almost guarantee that a good agent will more than cover their commission in costs savings for you. No matter how good of a negotiator you may think you are, you will not win against someone who does that day in and day out. Take your Realtor with you on your first visit to the property. In Summary... The biggest financial mistake that Homebuyers make is not having a professional Realtor represent them on what may be the largest financial decision of their life. 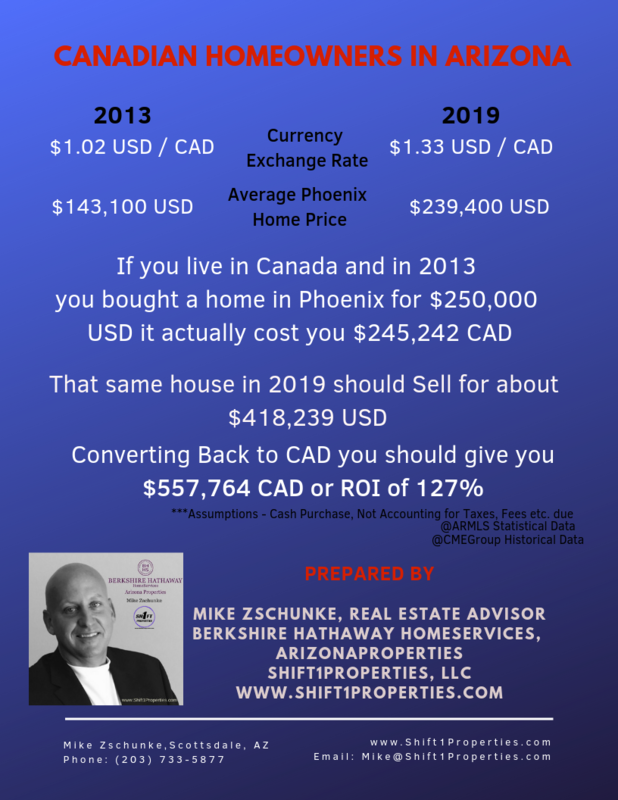 the estimated 46,000 Canadians living in Arizona and happened to purchase a home following the "Crash", you are doing pretty well with your Arizona investment. handsome profit if they were to sell that home in today's market. 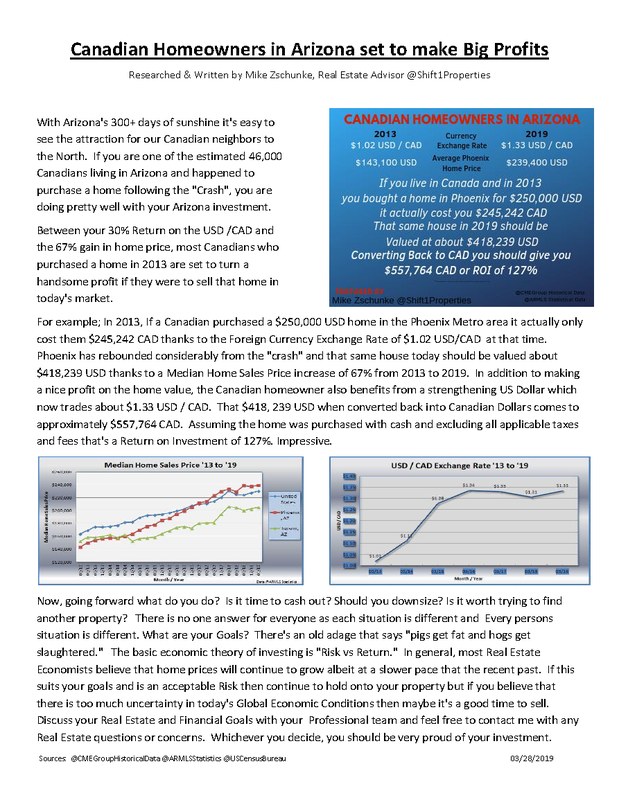 the home was purchased with cash and excluding all applicable taxes and fees that's a Return on Investment of 127%. Impressive. Now, going forward what do you do? Is it time to cash out? Should you downsize? Is it worth trying to find another property? you believe that there is too much uncertainty in today's Global Economic Conditions then maybe it's a good time to sell. questions or concerns. Whichever you decide, you should be very proud of your investment.